A 26-year-old woodcutter died as a result of injuries sustained while he was using a chainsaw to remove the limbs and top of a felled tree. The woodcutter was operating a chainsaw in a trail-cut operation and was working on a spruce tree approximately 15 metres long. He had started to delimb it and had cut it into two sections, but while he was topping it off, the sawblade struck the inside of his left thigh. The manager and foreman of the cutting operation had been working nearby and heard his cry for help. They rushed to help him, but there was little they could do and he died on the way to the hospital from blood loss. There were no eye witnesses to the incident; however, the health and safety officer’s investigation suggested that the victim had probably been pulling the saw toward himself in what is called a “backhander”. The investigating officer’s report noted that the victim had been wearing all proper protective gear at the time of the incident. Chainsaw operators should NEVER pull the saw blade toward themselves. All cuts should be directed away from the operator’s body. 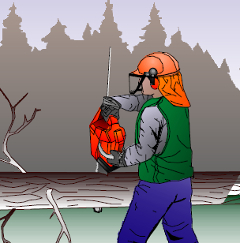 Employers are required by law to acquaint their workers with any hazards associated with the handling of tools or equipment, such as chainsaws, that they use in the course of their jobs. A. 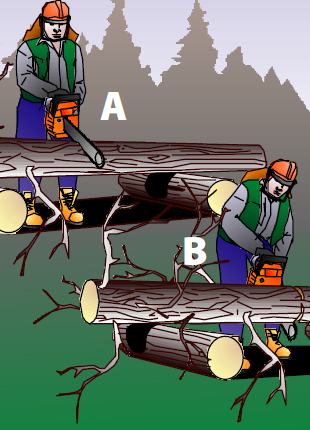 Make your first cut from the top side,extending to approximately ¼ the tree diameter. B. Make your final cut from the bottom side of the tree.